In the course of his pre-concert ‘from the piece outwards’ conversation, with Goldsmith’s Senior Music Lecturer, and co-founder of the Society of Minimalist Music, Keith Potter, Conductor Dennis Russell Davies was able to shed welcome light on some of the inspirations and working patterns of his long-term collaborator and friend, composer Phillip Glass. Waiting for the Barbarians, Glass’s 21st opera, based on Pulitzer Prize winner J.M. Cotezee’s 1980 novel, like the story itself, reflects on many issues relevant to 21st century lives, among them, racism, unfounded wars, complacency, and self-delusion. 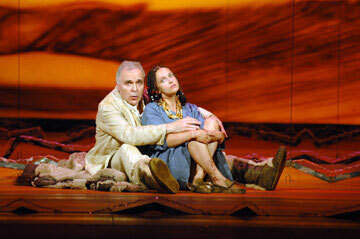 At opera’s opening in 2005 in Erfurt Germany, Glass, Davies and company received a fifteen minute standing ovation. An aging magistrate looks forward to retirement in a small frontier town in a nameless empire, until his peace is destroyed by the arrival of the Third Bureau, a group of military intelligentsia, led by self-righteous Colonel Joll. Acting upon their fears that the nomadic peoples living on the outskirts of the desert border are preparing to attack, the group put their brutal plans into action. The fact that their fears are unfounded is immaterial to them, as they determine to quash the alleged uprising before it begins. After capturing a number of ‘barbarians’ as they refer to the nomads, and bringing them back to town, they torture and kill several, as a lesson to anyone who may entertain ideals of freedom, conversely, believing themselves to be civilised. The Magistrate objects to their blatant brutality, but appears to stand alone in his beliefs, until he befriends a captured barbarian girl and decides that he will return her to her people. The fact that Glass had been interested in composing an operatic score for Coetzee’s novel since 1991, and had written a treatment for it then, displaces claims by the American press that the work is an ‘anti-Bush,’ opera, though the story’s generic ‘empire’ could be equated with that dubious regime as well as any others of a similar bent. The composer’s larger interest however, lay in the appropriately repetitive notion, Davies claimed, of ‘people repeating history at their own peril.’ The character of Colonel Joll, who is often seen as being very sinister, ‘is,’ the conductor continued, ‘just doing what a soldier does.’ The Magistrate ‘doesn’t have a love in his life…though his story is important on a personal level.’ It is the Magistrate’s story that Glass chooses to focus his opera upon, as he symbolises in Davies words, ‘an ordinary man in extraordinary circumstances,’ a notion which interests both composer and conductor. In terms of the novelist who created the story, J. M. Coetzee, critical writer Wood stated, ‘What his novels keep out may well be as important as what they keep in.’ Coetzee’s generic outpost and people, could be applicable to any culture, in any time-frame, so his novel’s lack of specifics also serves as its’ mine of possibilities. For Glass, who dislikes the minimalist term applied to his music, preferring instead, to refer to his work as, “repetitive music,” that would, no doubt, have been one of the novel’s other allures. For, as conductor Davies stated, Glass’s music ‘invites us to step back…As it’s ‘building blocks become thematic material, enabling one to ‘participate as a listener.’ It would seem then, that composer and novelist were, in their own extraordinary ways, in synch. The libretto, written by playwright/screenwriter/translator Christopher Hampton, who is perhaps, best known for his award winning play and screenplay Les Liaisons Dangereuses (1985), is faithfully based on Coetzee’s intelligently ambivalent text. Although the subject matter of the opera is disturbingly dark, it is not always unrelentingly so, though its levitating moments tend to stem more from the Magistrate’s personal revelations than more traditional operatic scenes of drunkenness and/or mistaken identity. Glass’s score is a cacophony of sounds, musical and otherwise, traditionally orchestral and/or operatic and those derived from other sources: jazz, Yiddish music, Aaron Copeland, Indian music, Debussy, film scores, and endless other influences, both from popular culture and, Glass’s own life experiences, which, combined, form a distinctively original landscape for the repetitive (in terms of history repeating itself) story being told. The uniqueness of each musician’s input into the mix can also be distinguished, which is incredible, given the number of musicians on stage in any given moment. There are specific times in the context of the score and story, which, almost seem to be indistinguishable, when one, two or a small group of musicians create effects which, intrigue, nearly as much as they heighten crucial scenes or moments. One gets the sensation of watching a large number of talented soloists, each performing to their utmost ability, rather than a cohesive unit, though the group also demonstrates their cohesiveness as a whole as well. What I’m saying here, is that within the context of the whole, each individual element is distinguishable, if one takes the trouble to focus on it, though that is one of the indisputable advantages of hearing Glass’s music, in that it always has the ability to instruct, as well as offering itself as compelling listening, ‘listen,’ as Davies said at the outset, being the operative word. Never have I seen so many musicians smiling with pleasure as they’ve played in an orchestra, but, as Davies indicated, Glass’s work isn’t about a virtuoso showing what he can do, it’s about utilising the imagination. A sense of irony was added in one intimate scene between the Magistrate (Salter) and the barbarian Girl (Soukop) by the use of a trombone for emphasis, rather than the usual saxophone employed for sensual scenes. Which, again, highlights the fact that in this Glass opera, as in many other pieces of his work, the ordinary parameters of what is acceptable within a genre, in this case opera, are expanded far beyond their normal bounds, to the point where anything seems possible, a very freeing notion for those who embrace nonconformity, and enjoy the unexpected, and sometimes, a very trying one for those seeking the tested and vested comforts of conformity. An idea, which, in itself is ironic, in light of the fact that Glass, almost inevitably, employs repetition somewhere within the context of his music! That paradox might explain some of the rather unforgiving reviews I’ve read of Glass’s music over the years, as for those who seek repeats of their ‘favourite classical pieces’ rather than new works, which function outside of the usual templates, Glass’s work may also serve the unwitting function of waving a red scarf in front of a bull. Although, having said that, in my experience, in recent years, Glass has tended to use the repetitive aspects of his compositions more as a reoccurring undercurrent, than as the main feature of a piece. In the case of Waiting for the Barbarians, Glass’s epic score imaginatively expresses weather, terrain, social conditions, emotional states as well as some of history, and mankind’s largest themes. Davies was far from being a static conductor, on this challenging endeavour, moving animatedly about on his podium as though he himself was acting out the story. During one scene, in which the stage was awash with bold red light, outlining his silhouette, the bald, black garbed conductor, furiously twirled his batons almost taking on the guise of Nosferatu leading an orchestra at the Gates of Hell. Baritone, Richard Salter, in his pivotal role of the Magistrate, was required to remain on stage for the duration of the performance, and his singing and acting never faltered for one moment of its two and a half hour duration, despite the fact that only a portion of the opera’s original sets are onstage and he was performing his role sans costume, before a full orchestra and semi-concealed chorus. (Who are behind one of the limited set’s occasionally opaque ‘walls’) His delivery was always impeccably clear, the emotive expressiveness of his singing voice, passionate or wisely controlled as scenes, or his fellow characters dictate. Salter has an uncanny ability to create empathy which elevates the entire production to an unrelentingly gripping realm, and rightfully, drew the most vigorous applause at the opera’s conclusion. The fact that Glass has chosen to cast a baritone, rather than a tenor in the leading role of his opera, is yet another mark of both his genius, as well as his individuality. As the emotionless ‘professional soldier,’ Colonel Joll, another Baritone, American Eugene Parry, chilled the marrow with his cold matter of factness in the face of the senseless, brutal atrocities he was ordering. Taking conductor Davies’ pre-opera cue that he was ‘just doing his job’ in the capacity of soldier enabled my appreciation of his performance to synch with his perfected portrayal. Parry has starred in many a Glass opera in his time. Kelly God was majestic as a character simply called ‘Cook’, sometimes acting as the Magistrate’s confident or procurer of female comforters. Her striking purple gown, lent her the air of a true diva as she moved across the stage towards the microphone, train trailing, to assume her eponymous character. Her firm but feminine soprano voice stood, word for word, against Salter’s expressive baritone, adding a sense of conversational immediacy to their scenes together. Elvira Soukop employed her lovely mezzo-soprano voice and fine acting skills to great effect as the barbarian woman, simply referred to in both novel and opera as ‘Girl.’ Soukop’s vocal interactions with Salter as the Magistrate were among the most memorable in the production. Bass Michael Tews emoted much better than his victims boded as the pit-bull like henchman, Mandel, while Soprano Marisca Mulder sang her role of Star, the Magistrate’s sometime companion with a breezy, but beautiful sense of abandon. Another intriguing aspect of this performance was pointed out by Davies’ comments on how ‘interesting’ it is ‘to do a stage production and then do a concert,’ though, he added, it can be ‘tricky for singers and performers,’ as they have ‘time to think,’ when performing their roles in the context of a concert. Bearing that in mind while watching the performance, made the moving acting of the singers, which was mostly, limited to their facial expressions, while they remained more or less, stationary behind their podiums, all the more commendable. Listening to the chorus was an experience in itself, as the unique sounds Glass had created for them were truly, out of this world, in terms of them being way out of the ‘normal’ operatic realm. They function as both spreaders and recipients of propaganda, mirroring the political spin that was being fed into the mass consciousness by media, politicians and the collective powers that be. One absolutely mesmerising sound emitting from them near the beginning of the opera gave a mental impression of circles, spiralling out upon themselves, in mid-air. In addition to making sounds which synched in with, or, worked against the orchestra, as in cases when they were highlighting such themes as man against machine, or self vs. system, the chorus sang phrases repetitively, making them seem like they were the voice of the masses either for, or against, the actions being conveyed by the singers playing the characters. Again, their function varied to the point where it seemed as though they are the most versatile group of singers ever, and considering the diversity of the score, that is very fortunate, indeed! When asked by a member of the audience what his favourite Glass piece is, Davies diplomatically replied, ‘The one I’m doing now.’ As a fan of Glass’ work albeit, a relatively recent one, compared to the length of his career, I could casually conclude that all in all, this concert was a thrilling evening of music. However, as an appreciative audience member, who has only ever seen one Glass opera performed, the mystically uplifting Satyagraha, at which the composer himself was present, I can now reiterate Davies’ claim, that for me, Waiting for the Barbarians is not only my favourite, but most inspiring Glass piece of all.